Happy Birthday, Winterbell and Snowbell! Happy Randomly-Picked Birthday to my fancy rats! Because I’ve had my rats for approximately two years, I thought it was a good time to wish them a random birthday! They didn’t get a proper celebration last year due to my own negligence, so I thought I’d give them a proper slew of birthday attention today! My girls are considered my “furry children” at the moment, since the Philosopher and I don’t have human children yet. I purchased the adorable sister pair after a really traumatic experience with a trio of gerbils. Despite the amazing care I had given them, all three of my gerbils died in the summer of 2010 after only living with me for about two months. Distraught and traumatized, I swore off gerbils forever and moved on to rats. I had read that rats were extremely hearty and very healthy. I can attest that those facts have certainly been true for my babies! Winterbell and Snowbell have been a barrel of fun, cuddles, cuteness, and happiness. Rats are amazingly affectionate animals and have been compared to dogs in their level of loyalty to their owners. Through constant care and daily playtime with me, my girls have become joyful, tame, and happy rats. They get out-of-cage-time everyday and they love to climb all over my shoulders. If you have always wanted a rodent as a pet, I highly recommend rats. They are fastidiously clean (they bathe themselves like cats and will only go to the bathroom in their house–never outside their cage) and very good for taking out to play. My husband and I have never seen them poo or pee in a place they shouldn’t. Also, rats love you SO much! Every time my sweeties hear my voice, they come running to the edge of their cage and peek out to see if I’m close by. They also have incredibly different personalities. Winterbell is an introvert and a mama’s girl. Snowbell is very energetic and social. She’s always the one checking out new people who visit our house. I will say, though, that if you get a rat, you need to get at least 1 friend for it. 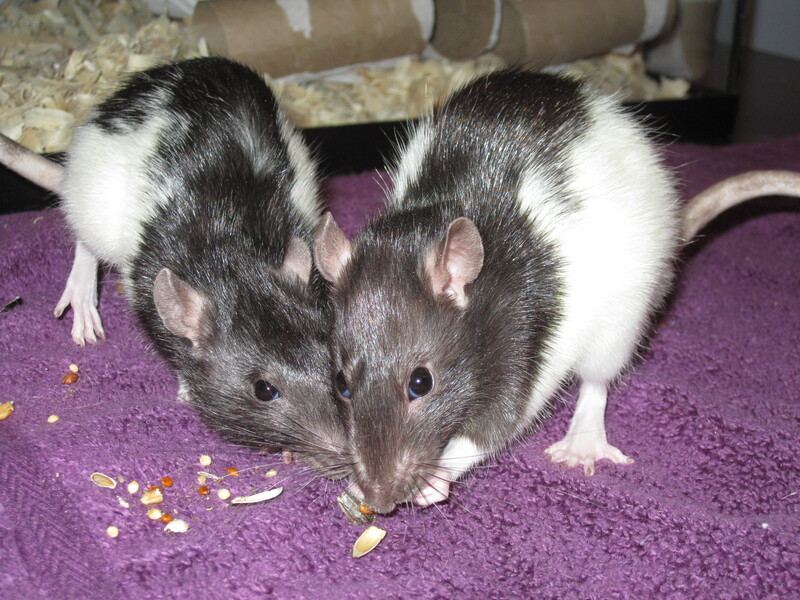 Rats are extremely playful and social. Since most of us are at work during the day, rats need a snuggle buddy, a play-time buddy, and a friend. You should all go get a pair of rats! Right away! They are very inexpensive and easy to care for! Happy birthday, darlings! I love you so much!! !